As a means of recording the passage of time, the 12th century was that century which lasted from 1101 to 1200. In the history of European culture, this period is considered part of the High Middle Ages and is sometimes called the Age of the Cistercians. In Song Dynasty China an invasion by Jurchens causes a political schism of north and south. The Khmer Empire of Cambodia flourished during this century, while the Fatimids of Egypt were overtaken by the Ayyubid dynasty. The temple complex of Angkor Wat, built during the reign of Suryavarman II in Khmer era Cambodia. c.1121, Battle of Didgori, the greatest military victory of Georgia. King David the Builder with 40,000 Georgians, 15,000 Kipchak auxiliaries, 500 Alan mercenaries and 300 French Crusaders defeated Seljuk led muslim coalition army of 400 000. 1122, Battle of Beroia results in the disappearance of the Pechenegs as an independent force. 1127, The Northern Song dynasty loses power over Northern China to the Jurchens of Manchuria. 1128, Portugal gains independence from the kingdom of León (recognised by León in 1143). 1130–1180, Fifty-year drought in the American Southwest. 1132, The Southern Song Dynasty establishes China's first permanent standing navy, although China had a long naval history prior. The main admiral's office was stationed at the port of Dinghai. 1132–1183, the Chinese navy increases from a mere 3000 marine soldiers to 52,000 marine soldiers stationed in 20 different squadrons. Between this time, hundreds of treadmill-operated paddle wheel craft are assembled for the navy, in order to combat the Jurchen's Jin Dynasty in the north. 1135–1154, The Anarchy is a period of civil war in England. 1136, Suger begins rebuilding abbey church at St Denis north of Paris, which is regarded as the first major Gothic building. 1139, Battle of Ourique against the Almoravides led by Ali ibn Yusuf. After this battle on July 26 the Independence of Portugal is declared: Prince Afonso Henriques becomes Afonso I, King of Portugal. 1145–1148, The Second Crusade is launched in response to the fall of the County of Edessa. 1147, A new Berber dynasty, the Almohads, led by Emir Abd al-Mu'min, takes North Africa from the Almoravides and soon invades the Iberian Peninsula. The Almohads began as a religious movement to rid Islam of impurities. 1147, The Wendish Crusade against the Polabian Slavs (or "Wends") of what is now northern and eastern Germany. 1154, the Moroccan-born Muslim geographer Muhammad al-Idrisi publishes his Geography. 1161, the Song Dynasty Chinese navy, employing gunpowder bombs launched from trebuchets, defeat the enormous Jin Dynasty navy on the Yangtze River, in the Battle of Tangdao and the Battle of Caishi. 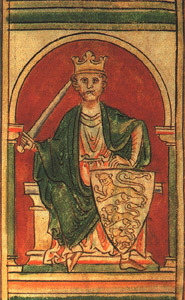 Richard I of England, or Richard the Lionheart. 1162, Genghis Khan, founder of the Mongol Empire, born as Temüjin. 1168, King Valdemar I of Denmark conquers Arkona on the Island of Rügen, the strongest pagan fortress and temple in Northern Europe. 1169, start of the conquest of Ireland. Richard fitzGilbert de Clare ('Strongbow') makes an alliance with the exiled Irish chief, Dermot MacMurrough, to help him recover his kingdom of Leinster. 1170, Thomas Becket is murdered. 1171, Saladin deposes the last Fatimid Caliph Al-'Āḍid, initiating the Ayyubid dynasty. 1178, Chinese writer Zhou Qufei, a Guangzhou customs officer, wrote of an island far west in the Indian Ocean (possibly Madagascar), from where people with skin "as black as lacquer" and with frizzy hair were captured and purchased as slaves by Arab merchants. 1185, Founding of the cathedral school (Katedralskolan) in Lund, Sweden. The school is the oldest in northern Europe, and one of the oldest in Europe as a whole. 1185, beginning in this year the Kamakura Shogunate deprives the Emperor of Japan of political power. 1187, Battle of Hattin: Saladin defeats the king of Jerusalem. 1189–1192, The Third crusade was an attempt by European leaders to reconquer the Holy Land from Saladin. 1193, Nalanda, the great Indian Buddhist educational centre, is destroyed. 1198, Frederick II is crowned King of Sicily at the age of 3 (also known as Frederick I of Sicily). c. 1200, The Toltec Empire collapses. Renaissance of the 12th century in Europe. Conflict between the Khmer Empire and Champa. Angkor Wat is built under the Hindu king Suryavarman II. At the end of the century the Buddhist Jayavarman VII becomes ruler. Pope Adrian IV grants over lordship of Ireland to Henry II of England. The medieval Serbian state formed by Stefan Nemanja and continued by the Nemanjić dynasty. The Liuhe Pagoda of Hangzhou, China, 1165 AD. Beginning of the Gothic architecture style in France. Building of Angkor Wat in Khmer empire. Christian humanism becomes a self-conscious philosophical tendency in Europe. Earliest record of a miracle play, in Dunstable. Beginning of trouvère music and poetry in France. Beginning of the Ars antiqua period in the history of Western European music. The Madrid Skylitzes manuscript illustrates the Synopsis of Histories by John Skylitzes. Earliest Western account of a mariner's compass, by Alexander Neckam is "De utensilibus" (see Shen Kuo). Although known in China since the 5th century BC, the blast furnace for smelting cast iron first appears in Europe, in and around Lapphyttan, Sweden, as early as 1150 AD. First fire and plague insurance (in Iceland). Invention of the Kente cloth. Hoysala architecture reaches a peak. Shahab al-Din Suhrawardi (1155–1191) founder of school of illumination (Ishraq). 1165 — The Liuhe Pagoda of Hangzhou, China, is built. 1107 — The Chinese engineer Wu Deren combines the mechanical compass vehicle of the South Pointing Chariot with the distance-measuring odometer device. The Durham Cathedral of England is completed. The kasbah of Marrakesh is built, city gate Bab Agnaou and the Koutoubia mosque. 1104 — The Venice Arsenal of Venice, Italy, is founded. It employed some 16000 people for the mass production of sailing ships in large assembly lines, hundreds of years before the Industrial Revolution. This page uses content from the English language Wikipedia. The original content was at 12th century. The list of authors can be seen in the page history. As with this Familypedia wiki, the content of Wikipedia is available under the Creative Commons License.